We are bakers, but we are parents too. 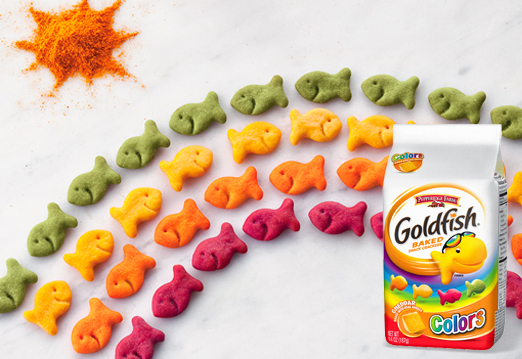 We bake our Colors Goldfish® crackers with smiles and ingredients that you can feel good about. We use only colors derived from plants, such as beet and watermelon juice concentrates and annatto. We use real cheese in every batch of Colors Goldfish crackers. It is specially aged for months to give the crackers their distinctive sharp flavor. We use real cheddar cheese in our Colors Goldfish crackers. It is aged for several months to give the crackers their distinctive sharp flavor. A spice that has an orange/red color. This spice helps to bring out the deep colors in some varieties of Goldfish crackers. Another spice that helps to enhance the taste and, when mixed with Blue, generates a beautiful green color due to its yellow pigments. A juice derived from beets, it helps to lay the red foundation in some varieties of Goldfish crackers. Watermelon and Huito (a South American fruit) are used to deliver the blue coloring. All other ingredients including enriched wheat flour, spices and color sources are not genetically modified.